The new Ford Mondeo delivers the global debut of a new pedestrian detection technology that could help reduce the severity of accidents or help drivers avoid them altogether. Pre-collision assist with pedestrian detection feature is delivered alongside the model’s widest range of powertrains, including the first Mondeo petrol-electric hybrid. Available in Ireland in a five-door bodystyle and as a wagon, the new Mondeo offers greater refinement and craftsmanship, technologies including Ford’s adaptive LED headlamps, inflatable rear seatbelts, multi-contour seats, and sophisticated design. “The new Mondeo is a beautifully designed package that has it all: great looks, great safety credentials, great technologies and great powertrains delivering excellent driving economy,” says Eddie Murphy, managing director of Ford Ireland. The car will arrive here during November. 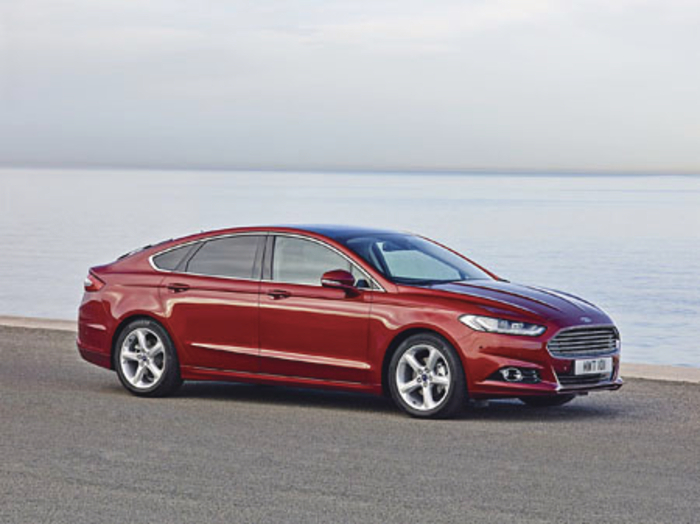 With prices starting from €28,995, the new Mondeo will be available in two series in Ireland, Zetec and Titanium. Standard specification on the Zetec includes 16” alloy wheels; front fog lamps; quickclear windscreen; day-time running lights; trip computer; MyKey; SYNC; cruise control; leather steering wheel/gear lever; power front and rear windows; and auto start stop. Irish customers will be able to choose between the well-proven diesel powertrains, the 1.6 litre 115PS and 2.0 litre 150PS (including a powershift automatic ) from launch. Coming in early 2015, engine choices will be extended to include the fuel-efficient and surprisingly powerful 1.0-litre EcoBoost petrol engine – that was named International Engine of the Year for an unprecedented third time in a row (and that's a jury I have had the honour to represent Ireland on for over a decade ). In addition, there will also be a new 1.5 litre EcoBoost 160PS engine. The four-door Mondeo hybrid, which will arrive in 2015, combines a specially-developed 2.0-litre petrol engine with an electric motor and 1.4 kWh lithium-ion battery to provide optimised fuel economy and low CO2 emissions. Mondeo Hybrid is the first hybrid electric vehicle that Ford will manufacture in Europe, delivering anticipated CO2 emissions of 99g/km. Ford’s new pre-collision assist with pedestrian detection can detect people in or near the road ahead, or who may cross the vehicle’s path. If the system detects a potential collision it automatically applies the brakes if the driver does not respond to warnings. The system processes information collected from a windshield-mounted camera, and radar located in the bumper, and checks it against a database of “pedestrian shapes” to help distinguish people from typical roadside scenery and objects. If a pedestrian is detected in front of the car, and a collision becomes imminent, the driver will first receive an audible and visual warning. Should the driver not respond, the system then shortens the time required to apply the brakes by reducing the gap between brake pads and discs. If there is still no response from the driver the brakes are applied automatically and the vehicle speed is reduced. Engineers tested the system on closed circuits using rigs fitted with life-size dummies. They also spent months testing and refining the system on roads around the world to prove system reliability under real world conditions. The new Mondeo also will apply automatic braking to mitigate or avoid a collision with a vehicle ahead. Active city stop operates at speeds of up to 40km/h (25mph ). At higher speeds new pre-collision assist uses radar and camera technology which allows it to scan ahead and automatically apply up to full braking force to help the driver mitigate or avoid many types of rear-end collision. Ford’s industry-first inflatable rear seatbelt technology will make its European debut on the new Mondeo. In the event of an accident, the belt rapidly expands to disperse crash forces across a body area five times greater than that achieved by a conventional seatbelt.